Anyone who plans to travel the interstate, state, county, and local roads that crisscross the United States needs a map. Colorful road maps, with their accordion folds, their town and city markers, and their road and highway networks, are among the most widely used maps. Indeed, a sense of nostalgia and exploration surrounds road maps, born out of gas station and rest stop travel maps that remind us of long-ago road trips. Road maps are the easiest—and least expensive—maps to obtain. Although the days of free gas station maps are only a memory today, most of the state transportation and tourism bureaus still provide free highway maps. These state government maps are of high quality, and they are frequently updated. State-produced maps are good navigation aids for intrastate travel. But when you need to travel more extensively, a commercial road atlas may be a better choice. These atlases range from compact editions that fit in a glove compartment to large volumes with leather bindings. 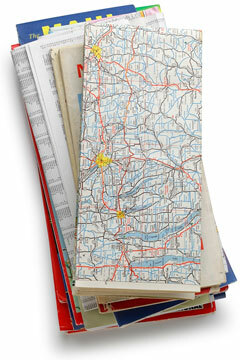 Some atlas publishers also produce single-sheet road maps for individual states, major cities, and specific regions. Many road travelers opt to join an automobile travel club such as the American Automobile Association, which provides road maps and trip planning services to its members. Of course, in this era of ubiquitous Internet access, smart phones, and GPS devices, many travelers simply use online road maps and GPS travel directions to plan their road trips. The United States of America is the third largest country in the world, covering almost 6.5 percent of the earth's surface. Without navigation tools like road maps and GPS units, American drivers would find it difficult to travel from place to place without getting lost, so travel maps are essential to help people find their way from state to state, and from coast to coast. Throughout the history of the United States, an adequate transport infrastructure has been important. Commerce, communication, trade, and tourism all depend on interstate transportation and navigational information to travel from point A to point B, and for other reasons as well. The mapping of time zones and the charting of travel schedules provide essential reference data for freight, courier, and public transport organizations, and have helped to develop the American people's understanding of time and distance—from Abraham Bradley's early post-road maps and stagecoach schedules to modern Greyhound bus route diagrams and schedules. Navigational maps help to define both the cultural and topographic nature of America. For instance, the contrast between its extensive road networks and its relatively limited passenger railroad infrastructure suggest that the USA relies primarily on automobiles for transportation. America's roads and highways have also been used to illustrate the nation's topography, as demonstrated in this All Streets black-and-white rendering by Ben Fry, which uses only transport routes to map out the form of the nation.